A Random Encounter in Griffith Park Leads to New Friends and These Family Resources for You. Happy Holidays! by Shakespeare in LA in Books, Gifts, Los Angeles Tags: Independent Shakespeare Co.
As you’d expect, I see a lot of Shakespeare in Los Angeles, especially in the summertime when you can find a myriad of productions being performed outdoors under the stars. This past summer, two of our friends cancelled at the last minute so we found ourselves with a couple of open chairs for Independent Shakespeare Co.’s production of Twelfth Night. 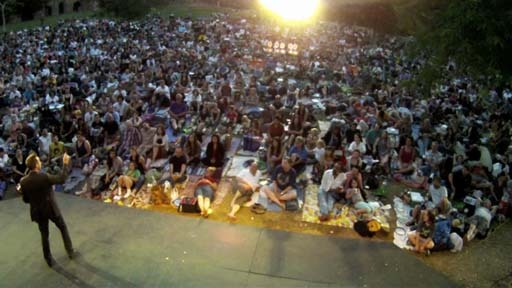 The Griffith Park Free Shakespeare Festival is a tremendously popular destination for families so the crowd was quite large on that particular night. Not wanting the chairs to go to waste, I walked to the back edges of the crowd and randomly asked a young family of three if they would like to join us. Surprised, but happy to see it from closer up, they joined us and we ended up having a lovely conversation about Shakespeare (they had a young daughter). Turns out they’ve gone to many productions around the city and are always on the lookout for those that would be fun for the whole family. What are the chances, right? Kelley shared a few of her favorite juvenile Shakespeare resources with us and I thought those of you with children might also be interested in them. Enjoy! And if you’re looking for some fun Shakespeare projects that are downloadable for free to pass the time over the holidays, here are a few links you might like to check out that I’ve found on my online travels. Happy Holidays one and all!